Matthew 19.V.13. "Allow the little children to come to see me, for the Kingdom of Heaven is for those who are like children". Matthew 18 V.3. "In truth, I tell you that if you don't become like these little children, you will not reach the Kingdom". Luke 9V.48 "Whoever becomes as humble as this child will be the most exalted in the Kingdom". Matthew 18.V.10. "Never scorn any of these children, for the angels in heaven watch over them and the Father in Heaven knows." Mark 10 V.16. Adds:- He took them in his arms, blessed them, touching the crown of their heads. What a Beautiful scene this must have been!! It has inspired painters and sculpters all over the world to show the goodness of the Master with the youngest of his flock. What can we learn from this? A new- born baby is like a blank page, on a computer awaiting instructions which will help create its own memory from each sensation whether it be joy or sorrow, love or rejection, success or failure. Will the child have a comfortable, privileged life, food, elegant clothes many opportunities? Or will he or she suffer abuse, or perhaps have to work all day for a meager wage, never seeing day light? Full of pure simplicity. To make life anew. He believes in happiness. One sees he understands. One thinks no more of the cares. Each day in France 2 children die, victims of abuse inflicted by their own parents. In Brazil 400,000 children have no home and live on the street and at least four of them are brutally murdered every day. Three million children die every year throughout the world because of starvation or abuse. (Sources: "Derniere Nouvelles d'Alsace" and the French press) . No, there is no excuse (poverty, unhappy childhood, violent memories lingering in the mind.) There is no excuse for those terrible parents guilty of the worst crimes: those of slowly killing with indifference, or prostituting their own children. In Brazil, Yugoslavia, the East and in Africa, Many tiny victims are abandoned, tortured, exploited or forced to work or prostitute themselves for perverted people. When one hears of small children made to work 14 hours a day to produce hand made carpets, or having to harvest an entire field of sugar cane with a crude scythe to earn a few coins, all under the threat of being beaten, tortured or mutilated, one cannot help feeling disgust and shame for those who exploit them in this way. Young innocent victims, who know nothing of evil, are savagely attacked or raped near their homes by monsters who are ill in their minds. These small children are easy prey and defenceless against these violations and will always carry within them the brutal memories. 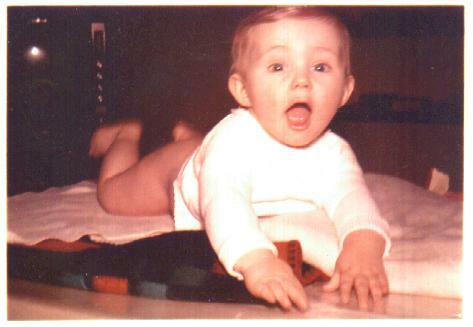 How many little angels (boys and girls) have disappeared without trace? The cherubs will have their place beside the external Father, but the perpetrators will find the hell they deserve. 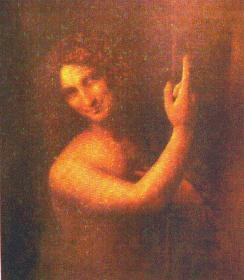 John the Baptist by Leonardo da Vinci -Louvre. Matthew recounted the circumstances of John the Baptist's violent death (Ch.14) and Mark also in (Ch 6 V. 14 to 31). Herodiade was very angry and made Herod arrest John and put him in prison. She wanted him dead, but Mark claims that Herod feared John and felt him to be a good man: a prophet send by God. He protected him and often listened to his wise sayings. However, on Herods' birthday, there was a great feast for all the notable people in the kingdom: including Jews and Romans, (except Pilate who only came to know Herod during Jesus' trial). At the end of the meal, Salome (Herodiades' daughter) entered the hall to dance. One can imagine the scene.
. They ate the veal and lamb which Herod provided, and drank his strong heavy wine. Suddenly Herodiade had an idea. This beautiful young girl, was dancing almost naked to the music of the orchestra: the only sound to be heard, as even the servers had stopped to watch. Herod, like the other men, had his eyes fixed on this beautiful woman; he was hypnotised and lost in a dream. Lying on his cushions, rather drunk, Herod devoured the young Salome with his eyes. He had desired her for a very long time: she lived in the same palace and He saw her often. However Herodiade her mother, watched over her closely and no one could approach Salome without her consent. After the entertainment, Salome went to kiss Herold and wish him a happy birthday. "Ask me for anything you wish. And I will give it to you. Even if you ask me for one half of my kingdom, it will be yours." " You must ask for the head of John the Baptist." Many of the guests were surprised by the girls' choice. She could have demanded the title of wife of the Tetrarch , which would have allowed Herod to reject her mother in a public declaration. Mark says that Herod was disappointed, but because of his promise and out of respect for his guests, he felt he had to give in to Salome's request. His lieutenants went down to the cell where John had been held for many months. John was praying when they arrived, and it was easy for the guards to sever his head from his body. For maximum effect, the guard did not clean the face of blood, but placing it immediately on to a silver plate he marched triumphantly into the great hall. Salome went to look at the strange gift her mother wanted so much, but she recoiled in disgust and asked the quard to show the trophy to her mother so that she could have her revenge. Everyone had started to drink again and that night Herod had terrible nightmares. His conscience told him he had killed a prophet, a man sent by God to the land of Israel. Mark 6 V. 29. The disciples of John came to collect his body and placed it is a sepulchre. They report all that had happened to Jesus. "He is John the Baptist risen from the dead and thus he can do miracles." "Herold will try to kill you." "Tell that sly old fox that today I am chasing away demons and healing people, but on the third day, I shall have finished. It is not a good idea to kill a prophet from Jerusalem." The Disciples of John the Baptist recovered the mutilated body of their master and buried him. Visibly the disciples were under the shock of this terrible drama. Very touched, Jesus took them into the mountains to give them a chance to regain their peace of mind in solitude. But the news of the death of the Baptist had also shocked the people, and they came in crowds to Jesus to ask him him to give them comfort. They sat as one man to listen to words of the Master. They sang some Hebrew hymns and by the evening no one wanted to go home. this place is desolate and the hour is already advanced, send back the crowd so that it can go into the surrounding villages to buy supplies. They don't need to go: give them to eat! Let them sit down, ordered Jesus. There is here a young boy that has five loaves of barley and two fishes, but is that enough for so many? These facts were written separately and many years after the death and resurrection of the Master, amid the terrifying conditions of persecution that dispersed the disciples to different countries. These events were remembered similarly, but in a different chronology. It is therefore amazing to compare the facts and numbers in the writings by the four evangelists exiled each to a different region... This likeness confirms the two multiplications of the bread. In spite of his griefover John, Jesus was moved with compassion towards this crowd. Having they had been fed, they respected his desire for solitude and returned home. They have been close to me for THREE DAYS and they have nothing to eat. If I send back now they will not have the strength to return home. However there were this time 4.000 men (without counting women and children), for whom Jesus multiplied seven loaves and some fishes. However, after everybody had eaten, the disciples collected seven full baskets of food still remaining! Can one imagine a crowd of 4000 men (or about TEN THOUSAND people if one counts the women and children), who followed Jesus patiently during three days and three nights because he lifted their spirits, healed the sick and spoke to them of a happier world to which they all would go? The crowd accepted everything: sleeping under the beautiful stars, wandering far from civilisation, to sit and listen in silence to a man who comforted them and gave hope to each one, in their lives of servitude and uncertainty! But the Master gave them his love, showing that he was capable of feeding them ALL with almost nothing: 5000 men and 4000 men with their families received manna and fishes as had their forebears during the crossing of the desert under Moses' flight from Egypt! After seeing these miracles the crowd was amazed and wanted to make him THEIR KING; already they saw him as the Messiah of the Scriptures. And no, Jesus had fed the people out of compassion for all the women and children who had followed him. Now, he was going to slip away from the crowd and find solitude. Nearly 2000 years after these miracles in Galilee the problem of the right to food for everyone is still an issue of immense importance. Certainly, we have developed our technology considerably, but too often, resources and profits are distributed badly. Let's follow the statistics of the world population that has grown considerably during the last two centuries. The number of human beings on earth increased in the last 150 years from 800 million inhabitants to close to six billion! Where will we find food for so many mouths? Yet, as the need for food increases, we squander the natural resources of the Earth and in the seas; and we also pollute or destroy them. It is an terrible problem: the growth of the population creates an enormous demand for factories and energy, which produce high quantities of carbon dioxides and radioactive waste harmful for the environment. This breaks the chain of nature's balance and destroys the atmospheric layers that protect us!